And, “Helps lay the groundwork for debates over whether our universities should be designed to broadly increase society's capacity for reason and insight, or should have their productivity monitored moment-by-moment by people who believe that 'everything can be measured in dollars'." 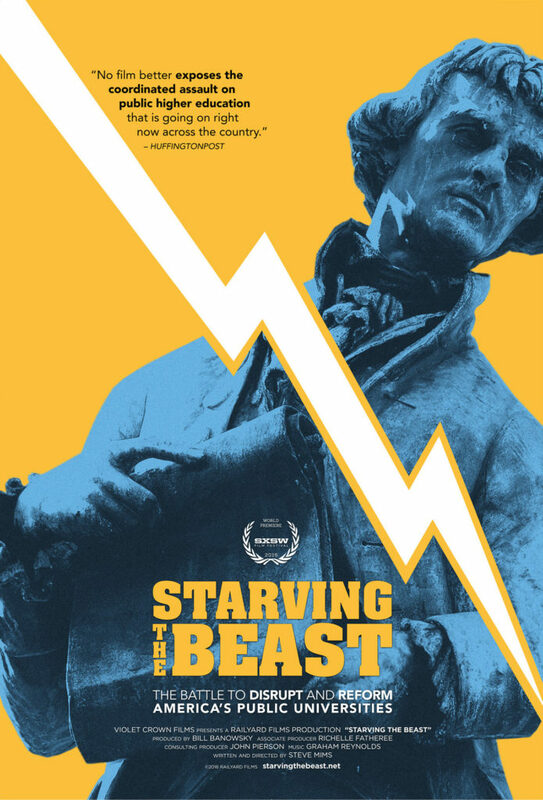 "Starving the Beast" tells the story of a potent one-two punch roiling public higher education right now: thirty-five years of systematic defunding and a well financed market-oriented reform effort. It’s the story of a little known and misunderstood ideological fight, the outcome of which will change the future of public higher education. "Starving the Beast: The Battle to Disrupt and Reform America’s Public Universities" examines the ongoing power struggle on college campuses and in state legislatures across the nation as political and market-oriented forces push to "disrupt and reform" America’s historic public universities. The film documents a philosophical shift that seeks to reframe public higher education as a value proposition to be borne by the beneficiary of a college degree rather than as a public good for society. The film focuses on dramas playing out at the University of Wisconsin, University of Virginia, University of North Carolina, Louisiana State University, and University of Texas and Texas A&M. "Starving the Beast" features interviews with James Carville (BA, JD Louisiana State University), George Cohen (Brokaw Professor of Corporate Law, University of Virginia), Gene Nichol (Boyd Tinsley Distinguished Professor of Law, University of North Carolina), Peter Flawn, Ph.D. (President Emeritus, University of Texas at Austin), Larry Faulkner (President Emeritus, University of Texas at Austin), Siva Vaidhyanathan (Robertson Professor, University of Virginia), Hunter Rawlings, Ph.D. (President, American Association of Universities), Noel Radomski, Ph.D. (University of Wisconsin-Madison), and many more. Acclaimed composer Graham Reynolds (Bernie, Before Midnight) provides the music for the film.